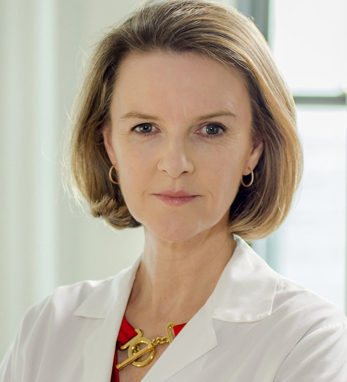 Dr. Geraldine McGinty is an assistant professor of radiology at Weill Cornell Medicine and an assistant attending radiologist at the New York Presbyterian Hospital. Her clinical specialization is in breast cancer diagnosis and she is an expert in healthcare payment policy and the economics of imaging. Geraldine attended medical school at the National University of Ireland, Galway, from 1982 until 1988. She continued her training in radiology in the U.S. at both the University of Pittsburgh Medical Center and the Massachusetts General Hospital, where she undertook a fellowship in women’s imaging. She was named vice chairperson of the American College of Radiology’s board of chancellors in 2016, and will become the first female board chair in 2018. She also holds an M.B.A. from Columbia University. Geraldine’s father was born in County Mayo and her mother in County Kerry. She says that being Irish means she understands “the sadness of being away from home but the possibilities that life in a new country can offer.” She is married to a fellow Irish native, Dr. John M. Greally.